Have you ever had your car’s gas light come on in an unfamiliar place? You’re not sure how or when you’ll find the nearest gas station. Without fuel, you can’t reach your destination. For more than 900,000 men, women, and children in New Jersey, the feeling of running on empty is a daily reality. They don’t know where their next nutritious meal will come from and struggle to reach their full potential. 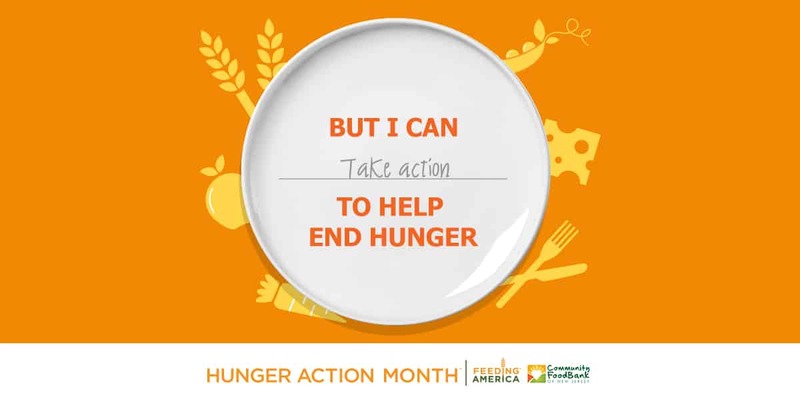 September is Hunger Action Month, a month to raise awareness, take action, and be dedicated to a solution to the hunger crisis. Together with Feeding America and its nationwide network of food banks, the Community FoodBank of New Jersey will mobilize to inspire others to do their part in the fight against hunger. Everyone has a role to play in fighting hunger, including you. 1. Volunteer with friends, family, coworkers, or social groups in one of our warehouses, at an off-site event, or at your local food pantry or soup kitchen. 2. Make a donation to the FoodBank. Every dollar provides three meals! 3. Host a food drive at work or in your neighborhood (traditional or online) and encourage donations of healthy non-perishables. 4. Advocate for our neighbors in need by contacting your local representative and asking them to oppose budget cuts to critical programs like SNAP, TEFAP, and WIC. 5. Register your school for Students Change Hunger, a statewide youth food and fund drive competition that kicks off on September 17. 6. Encourage your company to collaborate with us. We can’t do what we do without the generosity and engagement of our corporate partners! (More on the benefits of employee volunteering here). 7. Challenge yourself to buy food for the day with $3.72, which is the daily average budget for someone receiving Supplemental Nutrition Assistance Program (SNAP, formerly food stamps) benefits. (More on the need to protect SNAP benefits, here). 8. Get the latest FoodBank news and stay informed on critical hunger-related issues by following us on Facebook, Twitter, and Instagram and subscribing to our monthly eNews. Join the conversation by posting on your own social channels using assets from our toolkit. Remember to tag the FoodBank and use #HungerActionMonth. 9. Talk to your kids about food insecurity and inspire them to make a positive difference in the lives of children around them who may be facing hunger. Bring them to one of our upcoming Family Days to spend time together while giving back. 10. Spread the word and educate others on the issue of hunger in New Jersey. Share some of these ideas to encourage them to do their part. Hunger is solvable together. Your support makes a difference during Hunger Action Month and all year long.